Turning our attention back to the Transformers RotF line, here is Blazemaster from the 5th wave of deluxe figures. This guy loves to hover over his Decepticon foes and douse them in corrosive gel - sounds effective! 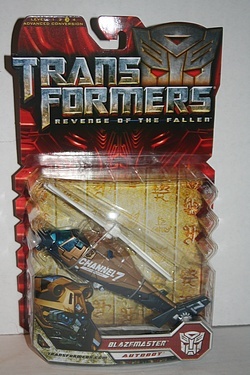 I do like how the alt mode is a TV news copter - since I still have not watched the actual movie I can only assume that this appears in the film. However, I know that some license is being taken with the upper waves of figures to extend the line, which I completely support. Click the image for some more shots and his full bio and specs.